Got stuff? Oh yes you do! 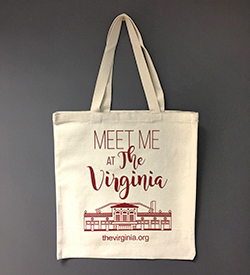 Put all of your favorite go-to items – for a grand day out, a trip to the store, or a quiet night on the couch – in this functional, attractive canvas tote featuring the historic facade of the Virginia Theatre! 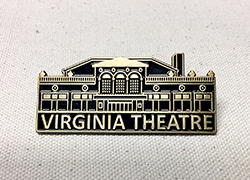 These beautiful enamel pins feature an artist rendering of the Virginia Theatre’s historic fascade and will make you both classic and trendy at the same time! All Virginia Theatre merchandise items are available for purchase at the box office as well as online. We are happy to ship items via the U.S. Post Office for an additional fee of $3.25. 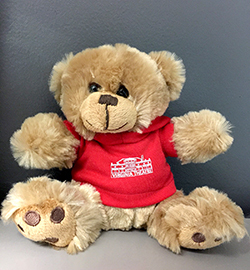 This adorable, soft, cuddly stuffed bear stands tall at 6″ and wears his hooded Virginia Theatre sweatshirt with pride! The Virginia Theatre is excited to announce that it now offers merchandise! Take home a memento of this beloved Champaign icon. 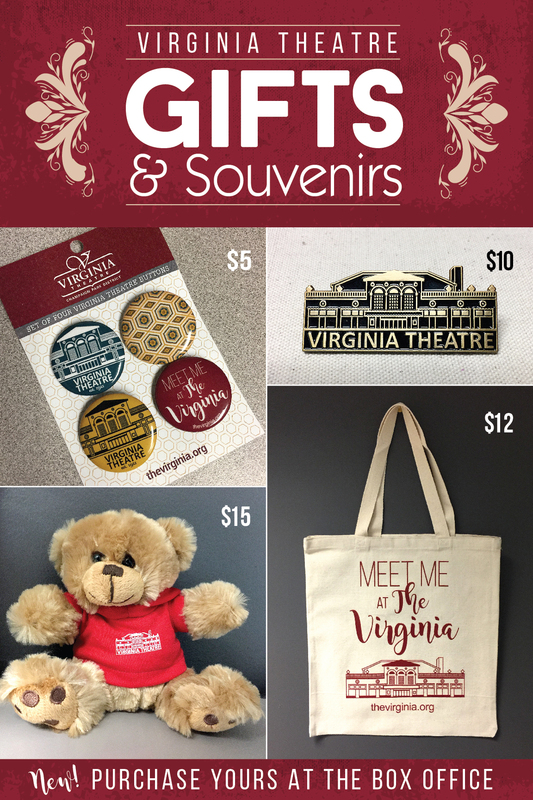 All Virginia Theatre merchandise items are available for purchase at the Virginia box office, concession stand, as well as online. We are also happy to ship any item(s) to you via the U.S. Post Office for an additional fee of $3.25. Take a look at our exclusive merchandise below! Take a tour of the beautiful, historic Virginia Theatre – from anywhere! With this interactive virtual tour, it will feel like you have stepped foot in this gorgeous, fully-restored 1921 opera house and move palace. Drag the mouse to change your point of view. Click on the circles on the floor to transport to another spot nearby. Click on the dots above the seats to move to different sections of the theatre. Move to different rooms in the building by clicking on the boxes at the bottom of the screen. Like what you see? To schedule an actual in-person tour, please call the Box Office at (217) 356-9063, or email moc.s1556289548krapn1556289548giapm1556289548ahc@w1556289548olram1556289548.hcti1556289548m1556289548.